Experts at performance appraisal recommend no less than three and no more than five performance objectives. During my four-decade career as a community marketing executive the number varied but mostly my performance was evaluated on five objectives, each weighted differently and recalibrated every few years. It was only coincidence that there are now considered to be five roles for such organizations. It isn’t an unreasonable exercise because each of my five performance objectives was woven from at least five sub-objectives. But more than three decades ago, researchers began identifying the dangers associated with too narrow a goal. Remember the Vietnam War and “body counts?” It is an example experts often cite because that obsession drew the military away from other more valuable metrics, a mix of which may have changed the outcome. Overlapping with that period was the explosive (literally) Ford Pinto which was built using only two metrics, “under 2,000 pounds/under $2,000,” which turned out to lead to structural design issues. Many management studies have warned that too narrowly focusing an organization’s leadership can lead to unintended consequences such as strategic breakdowns and dysfunctional systems, even unethical behavior. 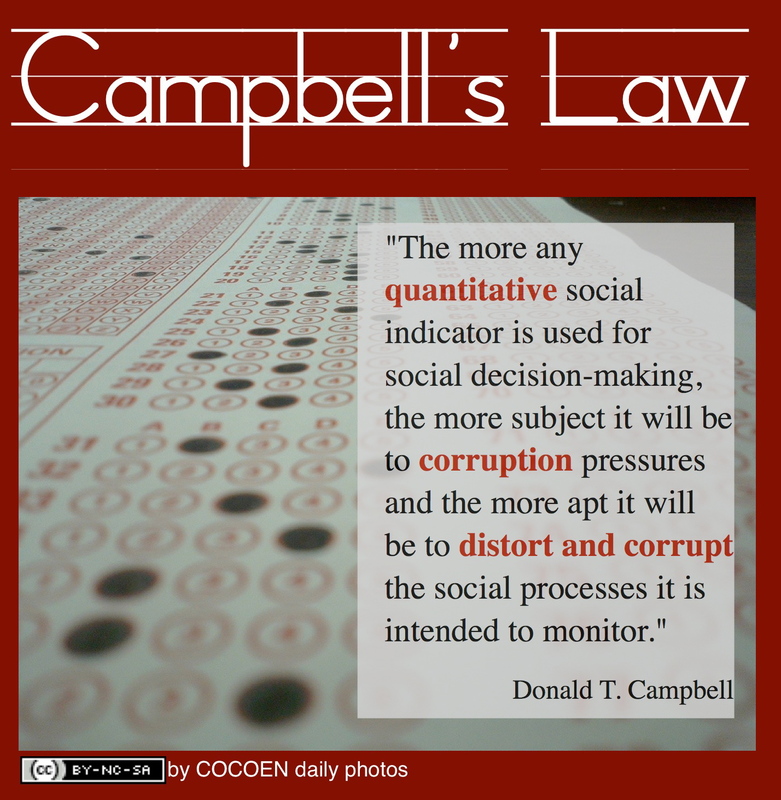 "The more any quantitative social indicator (or even some qualitative indicator) is used for social decision-making, the more subject it will be to corruption pressures and the more apt it will be to distort and corrupt the social processes it is intended to monitor." Many years ago one of my board members, who was very concerned for my welfare, tried to persuade my governing board as a whole to refocus one of my/our objectives around a couple of people who were bending ears about us, especially me. He, as many do in business circles, just wanted to stop the “boat from rocking. But prevailing voices raised an even more valid point. Unless those concerns were far more broadly held, spending too much time on so few would take away from energizing far greater numbers of stakeholders who supported what was apparently irritating to so few. In political circumstances like this, experts encourage organizations to look at the positive-to-negative ratio using scientific, generalizable methods. This is the ratio of people who feel passionately one way or the other about an issue or person. As long as the ratio is positive, focus as much energy as possible into energizing those stakeholders. This holds true in nearly every facet of life…not just community destination marketing and including hallway politics that carry over from high school into business and politics. For example, as I’ve mentioned before, 1% of performers generate more than half of all concert revenues. But Perry Marshall reminds us in his new book 80/20 that the same is true of sports teams where half of the fan revenue comes from 1% of the customers. He argues that this is a law of nature, not just business, because the same is true of a faith congregation of 400 members, 1% do half of the work and nearly all of the volunteering is done by less than 100 members. It is also true of our internal stakeholders for any cause, especially grass-roots support. Those most passionate about a cause represent 1% of the total but more than half of the passion and energy. Of course, 30% of any performance rating should relate to specific “core competencies,” which for CEOs today should include both innovation and strategic thinking. This is especially true for those in my former field, community destination marketing organizations where a CEO’s job description should include visioning along with strategic thinking and strategy making. The problem is that these abilities are hard to teach and resumes now indiscriminately throw these characteristics in without a clue as to what these terms mean. Studies show that fewer than 14% of Americans are strategically inclined. Research shows that executives average only 1% to 3% of their time building perspective for the future. Those who study strengths argue that competencies such as strategic thinking begin as talents that get refined by knowledge and skill-training and then refined with practice. This is why some people become disenchanted with higher education. They expected to graduate with talents and came away with only knowledge for a skill. As a professional discipline, strategy making began in earnest in the 1980s according to observations this month by experts at McKinsey & Company. But in many organizations it is delegated as only a process, negating the most important aspect of strategy making, agility. McKinsey applies ten tests to measure the effectiveness of strategies and four years ago a survey of executives around the world found that only a third believed theirs would pass more than three. Organizations that do best at strategy making are twice as likely to view it as an ongoing function in real-time, which makes it even more crucial as a core competency for CEOs. Planning has a place, but it is a platform from which to innovate and adapt strategically every single day. The report details the 13 facets of a chief strategist, broken down into five archetypes: architect, mobilizer, visionary, surveyor and resource manager. But in his experience, it is the latter two that are most important. Planning defines the dimensions of strategy making but Gluck explains there are also within each “strategic degrees of freedom” and strategy making must react daily to new developments and trends. To be meaningful and effective, according to Gluck, executives must synthesize and resynthesize analyses into strategic initiatives for continuing and never ending improvement and agile evolution. From my four decades as a CEO, the challenge for even the most strategically inclined CEOs is that many board members, community policy makers and especially investors, don’t have a strategic bone in their bodies. This is also why they talk innovation but don’t walk the walk. If you want a quick way to differentiate those who use strategic and innovation only as “buzz words,” they are the first to undermine data analysis and marketing intelligence while pushing worst practices such as traditional advertising. An alumnus who overlapped my time at BYU, Dr. Clayton Christensen, who coined the term “disruptive innovation” used to take notes in class by writing down the questions asked and later looking for the patterns that distinguished the most brilliant from the ordinary. He was putting into practice what management guru Peter Drucker had recommended in the 1950s when we were both in elementary school. I’m afraid to see his notations about my questions in class. Clayton’s been searching for a metric for innovation. In an article for Inc. Magazine, Ilan Mochari reminds us of terms that Christensen uses as a metaphors to distinguish organizations that are strategic and innovative. He recommends that organizations that are interested in long-term success should ignore stakeholders who act like tourists and focus on those who act like residents. Another way to view this in sense of place parlance is ignore those who are boomers and focus on the stayers. Community destination marketing, at its highest and most strategic level, is about guarding sense of place. These organizations pursue tourists by appealing to their instincts for being rooted, almost as if they were residents. They grasp that marketing is about asking questions, as much about disqualifying potential visitors for whom a destination would not be a good fit as it is storytelling to engage those in conversation for whom it would be. By nature, marketing community appeal is about strategic differentiation, marketing innovation and credibility. It can also be a very lonely job, thus my I forecast this week that executive levels will be increasingly inhabited by introverts and omniverts capable of strategic sustainability in rooms filled with stakeholders who simply aren’t.